WEST LAFAYETTE, Ind. (AP) — An exhibit of astronaut Neil Armstrong's personal papers is opening at Purdue University ahead of the 50th anniversary of his famed walk on the moon. CHAMBERSBURG, Pa. (AP) — When 94-year-old Margaret Gsell looks at the moon, she remembers the most interesting period of her life. BOSTON (AP) — The John F. Kennedy Presidential Library and Museum in Boston has received a $1.5 million gift from Raytheon to help commemorate the 50th anniversary of the Apollo 11 moon landing. Kennedy famously challenged the nation in 1961 to land a man on the moon by the end of that decade. Astronauts Neil Armstrong and Buzz Aldrin took the first steps on the lunar surface on July 20, 1969. PARIS (AP) — The ArianeGroup wants to send a scientific mission to the moon before 2025. Nearly 50 years after Neil Armstrong walked on the Earth's satellite, the Paris-based company said on Monday it has signed a one-year contract with the European Space agency to study the possibility of preparing a mission, with the aim of mining regolith. BEIJING (AP) — A Chinese space rover explored the lunar terrain on Friday in the world's first mission on the surface of the far side of the moon. Jade Rabbit 2 drove off a ramp the previous night and onto the soft, powdery surface after a Chinese spacecraft made the first-ever soft landing on the moon's far side. A photo posted online by China's space agency showed tracks left by the rover as it headed away from the spacecraft. PHILADELPHIA (AP) — The U.S. Mint in Philadelphia is marking the 50th anniversary of the first moon landing by launching a new commemorative coin. The children of Apollo 11 crew members Neil Armstrong and Buzz Aldrin were on hand at the mint Thursday at the first pressing of the 2019 Apollo 11 50th Anniversary Proof Silver Dollar. WAPAKONETA, Ohio (AP) — The Ohio hometown of the first man to walk on the moon has begun a months-long celebration honoring the 50th anniversary of Neil Armstrong's achievement. BANGOR, Maine (AP) — A Maine artist's Apollo 11 design will be on commemorative U.S. coins. The Bangor Daily News reports Belfast artist Gary Cooper won a U.S. Mint competition marking the 50th anniversary of the Apollo 11 mission. Cooper said he remembered watching the lunar landing and watching astronaut Neil Armstrong take his first step on the moon. LOS ANGELES (AP) — Making a movie about Neil Armstrong may not necessarily be on par with, say, successfully landing on the moon but the pressure involved isn't a giant leap from that either. There are astronauts who were there, for one, in Michael Collins and Buzz Aldrin, in addition to all the people who were on the ground at NASA ready jump on any inaccuracies. Whether you were alive then and glued to the TV, or relived it later through that iconic, grainy NASA footage, what you probably remember is just that: The majesty. DAYTON, Ohio (AP) — Flight enthusiasts will soon get a chance to acquire items from astronaut Neil Armstrong's personal collection of artifacts. KANSAS CITY, Kan. (AP) — NASA seeks to dismiss a federal lawsuit by a woman who thinks it will seize a vial of moon dust she claims was a gift to her from astronaut Neil Armstrong. SALT LAKE CITY (AP) — A strange thing happened after Neil Armstrong and the Apollo 11 crew returned from the moon with lunar rocks: Many of the mementos given to every U.S. state vanished. Now, after years of sleuthing, a former NASA investigator is closing in on his goal of locating the whereabouts of all 50. President Donald Trump says a docudrama about the moon landing would have been a "much bigger success" had it shown the planting of the American flag. But the movie, "First Man," won't be in theaters until Universal Pictures releases it next month. CHICAGO (AP) — Astronaut Jim Lovell will be the recipient this week of a lifetime achievement award from Chicago's Adler Planetarium. The award for Lovell, announced Wednesday, is to mark the upcoming 50th anniversary of the Apollo 8 mission and celebrate Lovell's legacy. Had Neil Armstrong been sick on July 16, 1969, Lovell, his backup, would have been shot into space in Apollo 11 and taken "one giant leap for mankind." Instead he watched the launch with famed aviator Charles Lindbergh. AUBURN, Ala. (AP) — An Alabama author who struck up a relationship with Neil Armstrong nearly two decades ago is behind a new movie about the first person to walk on the moon. The best-selling biography "First Man: The Life of Neil A. Armstrong" by Auburn University professor emeritus James Hansen has been made into "First Man," which debuted recently at the Venice Film Festival. BAY ST. LOUIS, Miss. (AP) — The future of NASA and space exploration begins in Mississippi, officials say, and with NASA's goal to return to the moon in 2019, Stennis Space Center is at the heart of the program. "Man may go to the moon (again) one day, but they're going to have to pass through Hancock County to get there," Gov. Phil Bryant said. Bryant was one of about 100 people who attended a RS-25 engine test Aug. 14 at Stennis, the first of 10 test fires for the first SLS project. NEW YORK (AP) — The sons of Neil Armstrong are defending Damien Chazelle's docudrama about the moon landing after conservative pundits decried the film's lack of emphasis on the American flag's planting on the lunar surface. In a joint statement Friday, Rick and Mark Armstrong, along with "First Man" author James R. Hansen, denied that Chazelle's film is "anti-American in the slightest." ''Quite the opposite," they said. NEW YORK (AP) — Damien Chazelle's last movie, "La La Land," was about a man clinging to nostalgia. His new one, "First Man," doesn't merely flirt with the past. It throttles back in time. But Chazelle's reason for revisiting NASA's 1969 mission to the moon isn't to polish the shining legend of Neil Armstrong. It's to jolt our collective memory of it — to rip it out of the history books and plunge us back into the harsh, anxious reality of what at the time was far from a fait accompli. CLEVELAND (AP) — It's been just over a year since a thief broke into the Armstrong Air and Space Museum in Ohio and stole an 18-karat gold replica of the Apollo 11 lunar module and other artifacts that have yet to be recovered or suspects arrested. CINCINNATI (AP) — Admirers of Neil Armstrong and space exploration have a chance to own artifacts and mementos that belonged to the modest man who became a global hero by becoming the first human to walk on the moon. WAPAKONETA, Ohio (AP) — The Armstrong Air & Space Museum in western Ohio will hold a groundbreaking ceremony for an expansion to the facility named for astronaut Neil Armstrong. Astronaut Robert Springer and Armstrong's son, Mark Armstrong, will be among the speakers at Friday's groundbreaking in Wapakoneta (wah-puh-kuh-NET'-uh). KANSAS CITY, Kan. (AP) — A Tennessee woman is suing NASA in Kansas to affirm her ownership of lunar dust she says astronaut Neil Armstrong gifted to her. Laura Murray Cicco filed the federal lawsuit Wednesday seeking to establish her moon dust ownership under the Declaratory Judgment Act of the United States Code, the Kansas City Star reported. WAPAKONETA, Ohio (AP) — An experimental aircraft flown by astronaut Neil Armstrong has returned to the museum housing it after a renovation. The rare aircraft has been a fixture at the Armstrong Air and Space Museum in the western Ohio city of Wapakoneta (wah-puh-kuh-NET'-uh), where Armstrong grew up. LAS VEGAS (AP) — From a surprise Cher performance to new footage of everything from Damien Chazelle's Neil Armstrong biopic "First Man" to M. Night Shyamalan's "Glass" and Jamie Lee Curtis's return to "Halloween," Universal Pictures pulled out all the showstoppers for CinemaCon attendees Wednesday morning. LAS VEGAS (AP) — "La La Land" director Damien Chazelle has given CinemaCon attendees a first look at his Neil Armstrong film "First Man" Wednesday morning in Las Vegas. The heart-pounding trailer shows Ryan Gosling as Armstrong feeling heavy with responsibility before his historic mission to the moon. The footage features him telling his children, and wife, that there is a chance he won't make it. Chazelle says he wanted to get to know the people who embarked on that incredible journey. Ambiguous and damning at once, John Curran's "Chappaquiddick" plunges us back into the summer of 1969: the season of Woodstock, the moon landing, the Manson murders and the lowest ebb of the Kennedy mythology. HOUSTON — NASA astronaut Bruce McCandless, the first person to fly freely and untethered in space, has died. He was 80. NASA's Johnson Space Center said Friday that McCandless died Thursday in California. No cause of death was given. A half century ago, space exploration was a source of wonder that intrigued scientists, politicians, generals and romantics — each with their own visions of what the stars could mean for humankind. For a young boy growing up in New Jersey, whose parents woke him up in the middle of the night to watch Neil Armstrong take his first steps on the moon, it was the start of a strange recurring nightmare. NEW YORK (AP) — Legendary astronaut Buzz Aldrin and the U.S. Air Force's highest-ranking woman joined Mayor Bill de Blasio and others at the city's Veterans Day parade. Cory Michael Smith is set to join Damien Chazelle's Neil Armstrong biopic 'First Man'. The 30-year-old actor - who is best known for playing The Riddler in 'Gotham' - is going to be cast as astronaut Roger Chaffee in 'La La Land' filmmaker Chazelle's space picture , Deadline reports. Chaffee was one of the astronauts on board the Apollo program and served as capsule communicator for the Gemini 3 and Gemini 4 missions. In 1969, the space capsule Columbia made a nearly 500,000 mile round-trip, carrying the first men to land on the moon. On Saturday, it served as a copper-colored backdrop for selfies at the Space Center Houston. "It's impressive," said Alana Oehler, 68, standing beside the golden-visor space helmet and silicone-tipped gloves of Buzz Aldrin, who followed Neil Armstrong onto the lunar surface. BOSTON (AP) — John Glenn was the first person to snap a photograph of Earth from outer space. Neil Armstrong took the first picture from the moon's surface. Ryan Gosling worries Emma Stone has "forgotten" him. The 36-year-old actor has worked with his friend on three movies, 'Gangster Squad', 'Crazy Stupid Love' and 'La La Land' and though he'd love to make another film with her, he joked he isn't sure she'd be so keen after her role in the musical swept her away to awards success earlier this year. Asked if they're planning a fourth collaboration, he joked: "If she'll have me. I hope. She's a busy person. She's probably forgotten all about me. WAPAKONETA, Ohio (AP) — An experimental aircraft flown by astronaut Neil Armstrong is going on a journey across Ohio so that the 60-year-old plane can be restored. The rare aircraft has been a fixture at the Armstrong Air and Space Museum in the western Ohio city of Wapakoneta where Armstrong grew up. But the plane known as an F5D Skylancer is now in need of a makeover. WILMINGTON, Del. (AP) — It's just a few blocks from the house Earl Rice Jr. left behind as a teenager to the places he remembers. But after more than four decades in prison, he has ground to cover. Skirting Franklin Street's neatly trimmed lawns in long strides, and praising the glories of the afternoon heat, he reaches the park where he and his brothers used to go sledding. Across 18th, kids, laughing and shouting, bound down school steps. Rice slows, taking it all in. WAPAKONETA, Ohio (AP) — An Ohio police chief says a rare, solid-gold replica of the lunar space module wasn't the only item stolen from the Armstrong Air and Space Museum over the weekend. Wapakoneta (wah-puh-kuh-NEHT'-uh) Chief Russel Hunlock says award medals and presentation coins also disappeared from the same museum display case in late astronaut Neil Armstrong's hometown. CLEVELAND (AP) — Whoever broke into an Ohio museum and stole a solid-gold replica of the Apollo 11 lunar module likely intends to melt it down for the value of the gold instead of trying to sell what could be a collectible worth millions of dollars, said a retired NASA agent who has helped recover stolen moon rocks worth millions of dollars. WAPAKONETA, Ohio (AP) — Ohio police say a rare gold replica of the lunar space module has been stolen from the Armstrong Air and Space Museum. Police in Wapakoneta (wah-puh-kuh-NEHT'-uh) responded to a museum alarm late Friday night and discovered the 5-inch (12.7-centimeter) high, solid-gold replica had been stolen. President John F. Kennedy once said in a now famous speech that “We choose to go to the moon in this decade and do the other things, not because they are easy, but because they are hard." Here on Planet Earth, the Vietnam War was raging; rock bands Pink Floyd, The Doors and Yes released new albums and the venue for Woodstock had just been chosen. But on July 20, 1969 and more than 270,000 miles away, three men stepped onto the moon becoming the first humans in history to accomplish the feat. NEW YORK (AP) — A bag containing traces of moon dust sold for $1.8 million at an auction on Thursday following a galactic court battle. 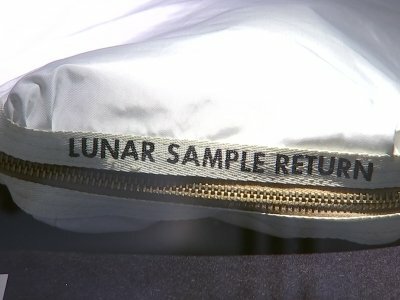 The collection bag, used by astronaut Neil Armstrong during the first manned mission to the moon in 1969, was sold at a Sotheby's auction of items related to space voyages. The buyer declined to be identified. The pre-sale estimate was $2 million to $4 million. The Apollo 13 flight plan with handwritten notations by all three crew members has fetched $275,000 at auction in New York City. The flight plan was sold at Sotheby's auction Thursday of items related to space voyages. NEW YORK (AP) — Moon dust that Neil Armstrong collected during the first lunar landing was displayed Thursday at a New York auction house — a symbol of America's glory days in space now valued at $2 million to $4 million. The late astronaut brought the dust and some rocks back to Earth in an ordinary-looking bag. It's one of 180 lots linked to space travel that Sotheby's is auctioning off July 20 to mark the 48th anniversary of the pioneer lunar landing on that date in 1969.